Officials from Garfield township, came before the board with a request for assistance in December of 1997. Kurass Lake had been rising continuously for the past couple of years and after the township raised the road two different times, it was within four inches of overtaking the township road again. This road was a school bus and mail route, and the main access for the area. The situation presented a significant hazard to travel. The Garfield township board had surveyed the area and discussed options available with the DNR. The DNR agreed that the lake is definitely above the ordinary high water mark and could be lowered 2' to bring it back to it's former level. 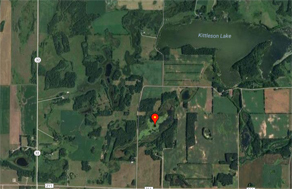 The lake, as per their survey, could be drained to the southwest through a series of small potholes and eventually drained into Kittleson Creek. After review of the township survey, it was determined that a control structure could be placed on the driveway east of Allen Torpet's driveway (regulated by the watershed) and with minor dirt removal between the sloughs, Kurass Lake could be drained down during non-flood event periods and closed during flood periods. The sloughs would not be drained, but water would pass over the top of them. With this project in place, water would be released during the summer and fall with excellent storage available to hold the spring runoff until downstream channels are able to handle the runoff. The district agreed to up to $5,000 on an 80% watershed, 20% township split. Permanent easements for construction and future maintenance from the landowners involved were obtained by the township.